Thanks to everyone who gathered at Alamosa Books on Saturday night to make the Book Launch for FORGET ME NOT such a success. 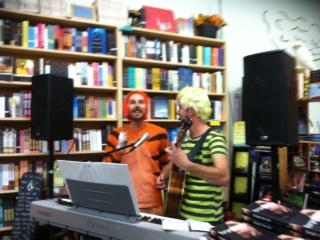 Since it was so close to Halloween we had a costume contest along with all the other festivities. 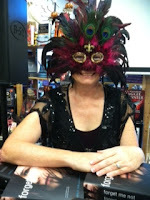 Here I am above in the mask I bought in New Orleans two years ago. It's been hanging on my wall just waiting for an occasion to be worn. There was also a Raven Trivia Challenge. People searched the bookstore looking for the eight ravens hidden among the shelves. Each raven had a yellow card that displayed a bit of raven trivia.﻿ They answered the questions and then turned in their answers to be part of a drawing. 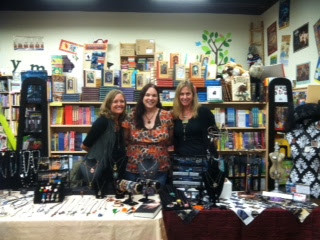 Sherri Erler, Debi Hennigan, and Shauna Mellady displayed their fabulous jewelry. Many of the pieces were created specifically for the book launch. Winners of the costume contest and Raven Trivia Challenge each got to pick a piece of jewelry to take home. Check out the photos on the GHOST TOUR page﻿ to see closeups of their handiwork. If you see anything you'd like to buy you can contact Sherri here. 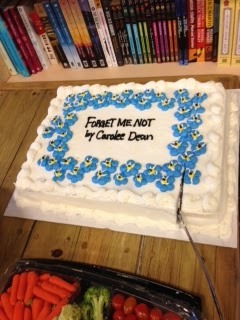 And finally, no book launch would be complete without a cake. Thanks again to everyone who came out for the event. 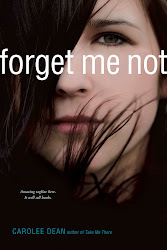 For those of you who weren't able to make it, there are autographed copies of FORGET ME NOT at Alamosa Books. Find out who haunts the hallway where Ally is trapped between worlds in Forget Me Not in the 9th and final stop on the Ghost Tour. Join me and Kari Olsen over at her blog, A Good Addiction. Then come back over to the Ghost Tour and scroll to the bottom of the page to find the Rafflecopter. 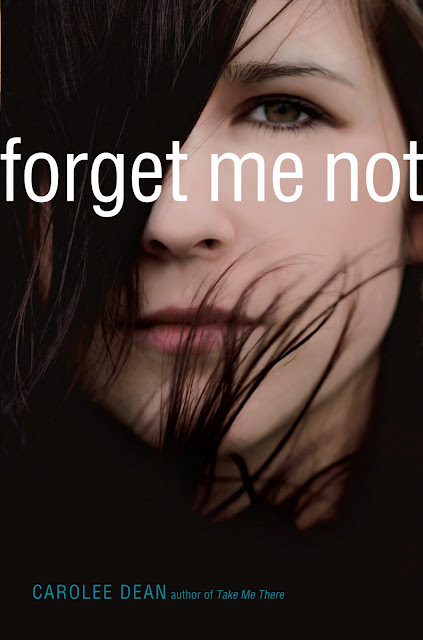 You could win a free copy of Forget Me Not and this raven feather bookmark designed especially for the Ghost Tour. The contest will go on until October 31! Friday, October 5th, my husband and I met friends at the Aux Dog Theater. It's a small theater on Monte Vista just off of Central down by UNM. I'd never been to the Aux Dog before and was delighted to find a cozy lobby with live music both before the production and during intermission performed on bass flute by a man in a tuxedo and wig. A friend of ours was in the play, The Haunting of Hill House. It was based on the novel of the same name by Shirley Jackson. She is probably best known for her short story, "The Lottery" first published in 1948 in The New Yorker magazine, which was subsequently inundated with mail in response to the story. I still remember reading "The Lottery" in my high school English class. The actors did a wonderful job. My favorite character was the snarky housekeeper, Mrs. Dudley, who kept reminding everyone that she would be leaving "before dark" and that if they screamed, the house was so remote that no one would hear them. "The Haunting of Hill House" is going on now through October 28. Get details at the theater's website. 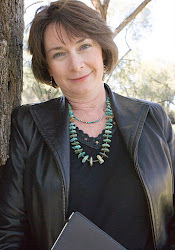 It's time for Stop #8 of the Ghost Tour with Lisa Reeves over at A Life Bound by Books. 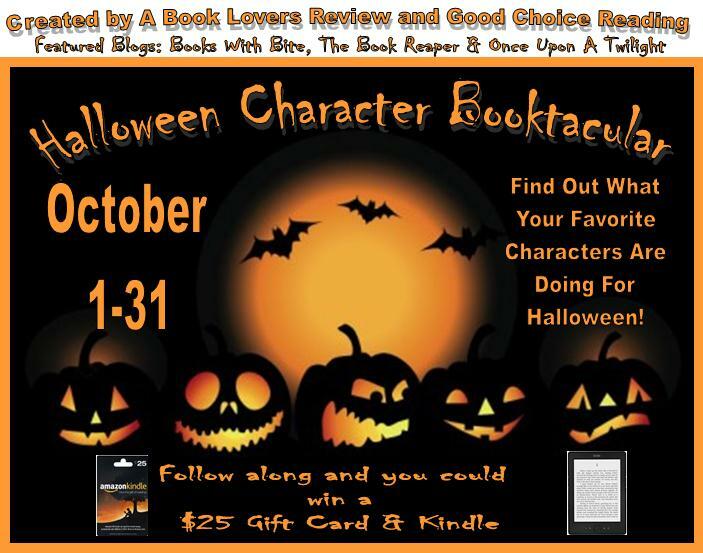 For the month of October she's asking authors to share their real life scary stories. My post is entitled "Haunted by a Dead Girl" where I reveal where I got my middle name (hint: Think Poe and "The Raven.") I also discuss the real life ravens that live at the school where I work that inspired the birds of Raven Valley High School in FORGET ME NOT. Join me today over at the Open Book Society with Heidi Holzinger for the Raven Trivia Challenge and Stop #7 of the FORGET ME NOT Ghost Tour. Discover the names of the ravens that belonged to Odin, the Norse god of death and poetry and find out why they were referred to as Observation and Memory. Then head over to Ghost Tour Central and scroll to the bottom of the page to the Rafflecopter to find out how you can win the Observation and Memory glass bead necklaces above that were designed especially for the tour. The Raven Trivia Challenge is also going on LIVE over at Alamosa Books until the book launch on October 27 where there will be music, food, and more prizes. If you live in Albuquerque, NM, head on over to the bookstore at 8810 Holly Ave. NE where you will find ravens lurking all around the bookstore. Find raven trivia posted next to the birds and discover other ghostly books nearby written by Albuquerque authors like Ghosts of Old Town by Cody Polston above. He's president of the Southwest Ghost Hunters Association and he's talking about his experiences with ghosts on October 27 at Alamosa books from 4-5 right before my book launch from 6-7. Several SCBWI friends are featured. Check out Haunted by Chris Eboch, The Secret of Laurel Oaks by Lois Ruby, and Circle of Secrets by Kimberley Griffiths Little. And while you're there, check out the display for Forget Me Not. Wow! That's a lot of books.﻿ Don't forget the book launch on October 27. Stop #6 of the FORGET ME NOT Ghost Tour is also part of the Halloween Character Booktacular put on by Damaris Cardinali and Trini Contreras. Visit Good Choice Reading to read the Poe-Pac Mash Up - a poem based on Poe's "Raven" featuring 2Pac as a substitute teacher and to find out how you can win this cool poster. Then come back to the Ghost Tour to join the Rafflecopter for a chance to win other cool prizes. It was a Friday afternoon. It was rush hour. It was raining. I had just gotten a hot crystal massage and had oil in my hair. I spent the day sitting through inservice presentations at school and hadn't been home since 7:00a.m. I was supposed to meet my husband at 7:00p.m. for dinner at a restaurant near the Aux Dog Theater on Central where we were joining friends to see "The Haunting of Hill House" and I was thinking it might be a good idea to go home first and take a hot shower. But Lois Lowry was speaking about her new book, Son, at the UNM continuing education building at 6:00 p.m. at an event sponsored by Bookworks, one of our local independents. I'd been talking about The Giver with some of my students earlier that week who were reading it in class and had encouraged them to attend the event. It was 5:15p.m. I stood in front of the mirror at the massage place, assessing the state of my hair and figured, what the heck, this is one of the reasons why I cut it all off (note: current blog photo is a little old. My current hair style requires no brushing, spraying, or blow drying). So I wet it down and off I went. As soon as I arrived I found my friend, Rio Rancho city librarian Rebecca Donnelly, and sat next to her, apologizing profusely ahead of time that I was going to have to leave early to make my 7:00p.m. dinner date with my husband. 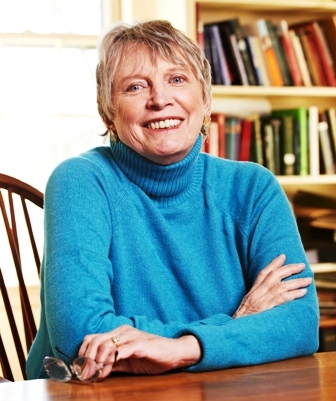 Lois Lowry is one of very few authors to win the Newbery twice for The Giver and Number the Stars. Son is the fourth and final book in The Giver Quartet and just received a fabulous NYTimes review. She shared her inspirations for her books. Number the Stars was based upon the stories told to her by a friend who had grown up in Denmark. The Giver was strongly influenced by the importance of memories. Lowry said she thought a lot about human memory as she saw her father's memory slipping away. She told the audience that memories are very personal. We all have our own memories. Even people experiencing the same event remember the details of that event differently. These ideas are what inspired her to create a Community that could manipulate memory. Building upon that concept, she then created the main character, Jonas. 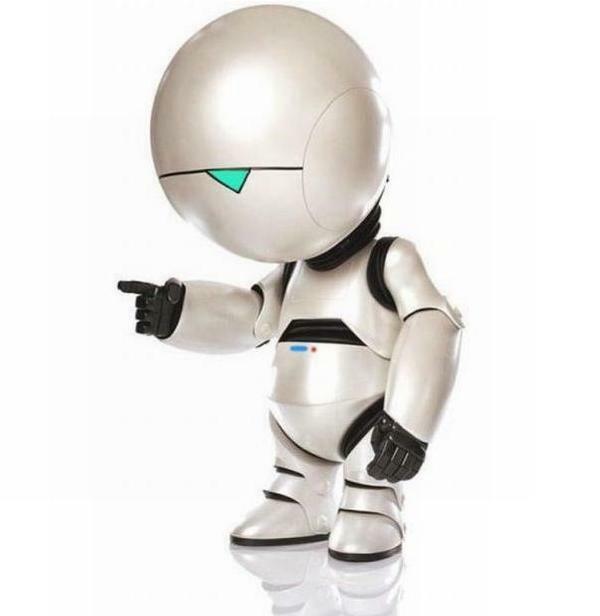 Lowry likes characters ages 12-13 because they are still children but entering adulthood and trying to figure out their identity. I get chills just reading the description. And now I'm off to rearrange the stack of books on my bedside table. So many fabulous books came out this October, and Son is right on top! 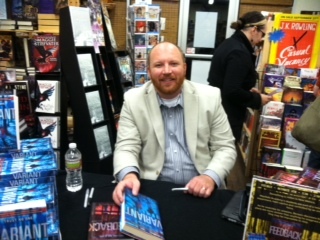 Author Robison Wells was at Alamosa Books last week. I don't usually attend author signings on Tuesdays because it's my late day (after working at my regular high school I drive across town to see kids at a Charter School). But it was right before our monthly SCBWI meeting so I decided to skip dinner and go to the bookstore. Not only did Robison Wells have a fascinating story to tell, I also discovered that he has the same agent that I do - the amazing Sara Crowe. She has a blog featuring posts from her authors. Check it out at the Crowe's Nest. Robison said he didn't plan on being a writer. 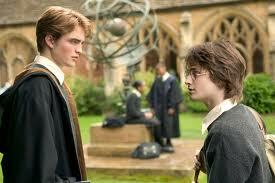 His older brother is a writer (Dan Wells is also represented by Sara Crowe). Robison told him he had a great idea for a story and that Dan should write it. Dan told him to write it himself. He also told Robison a piece of advice that has stuck with his younger brother for years. "The difference between writers and everyone else is that writers actually write." I have found this to be very true. 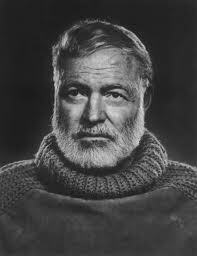 A lot of people want the experience of "being" a writer but very few are willing to put forth the effort. 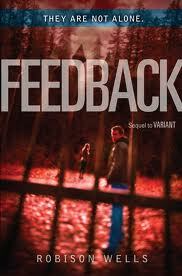 Fortunately for all of us, Robison was willing to make the effort or else the world wouldn't have Variant and the sequel, Feedback. 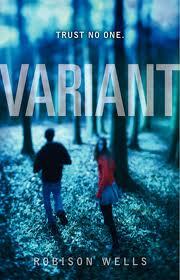 Variant is the story of a young man, Benson Fisher, who receives a scholarship to Maxfield Academy, only to discover, soon after his arrival, that he has become a prisoner of the school. The most interesting part of Robison's talk was his discussion of what happened between writing the two books. He began to suffer severe anxiety attacks and became unable to leave his house. His work suffered and his family became very worried. I'm not going to go into details here because it is Robison's story to tell and he has been brave enough to share his experiences on his blog. One of the reason's I connected so strongly with his story is because I suffered almost daily panic attacks from the ages of 13-22. I never knew why they started or why they stopped, though I have some theories, and I never told anyone about them until many years later. I'm always impressed by people who are not only brave enough to seek help but who are also willing to share their experiences with others who might benefit from their perspective. 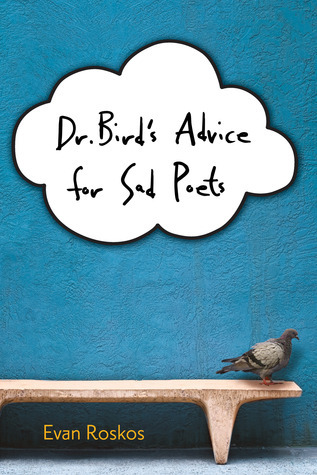 Interestingly, Ethan Roskos, another Crowe's Nester and author of Dr. Bird's Advice for Sad Poets, wrote a post this past Thursday for the Crowe's Nest about his experiences with depression and social anxiety disorder. The article was written in honor of Mental Illness Awareness Week (Oct 7-13 2012). He discussed how helpful stories can be in helping people know they are not alone. Here is my favorite quote from his article. "It’s not about seeing a character that’s just like me -- instead, it’s seeing a character that suffers like me. The difference is key and profound. If a character had to be just like me to inspire me to talk about my depression, I’d read for a thousand years and never speak. In truth, we only need to see familiar suffering, familiar worry, familiar fears, familiar manias in order to build strength. Or to just find the words." To read the rest of his article go to the Crowe's Nest. I feel very honored to be a fellow Nester with such brave men! one she can confide in. Lisa Schroeder is a fabulous verse novelist. I had the honor of speaking with her on a verse novel panel at the International Reading Association last spring in Chicago along with April Halprin Wayland and Caroline Starr Rose. While you're enjoying the interview with Ernest, check out Lisa's site and her newest novel in verse - THE DAY BEFORE. Lisa Schroeder's Blog. Lucky me! I got to spend the day with four delightful authors at two high schools. From right to left: Vaunda Micheaux Nelson (recent winner of the Horn Book Award for No Crystal Stair, Kersten Hamilton (author of the Tyger, Tyger series), Besty James (author/illustrator and mastermind behind The Seeker Chronicles), Carolyn Meyer, (author of the Young Royals Series/expert on dysfunctional royal families), and me, Carolee Dean. We held an author panel at Rio Rancho High School in the morning and Cleveland High School in the afternoon. The topic was "How Authors and Students Conduct Research" and we discussed everything from using Facebook to "research" prospective prom dates to learning how to build a computer by watching YouTube. There was also mention of the difference between .com, .org, and .edu sights as well as how to effectively use Wikipedia as a starting place for more in depth research. We all shared stories about interesting people we have interviewed and places we have visited. The five of us are in the process of preparing for our YALSA panel in St. Louis in three weeks. If you are going to be attending YALSA, please stop by our session, or if you know any librarians making the trek to St. Louis, tell them to stop by and say hello. Join me today over at Elana Johnson's Blog for Stop #4 of the Ghost Tour where Elana Johnson interviews one of the main character's from Forget Me Not - Elijah McCall. Find out why he spent a month speaking in iambic pentameter. While you are there, check out Elana's books. She is the young adult author of Possession, Regret, Surrender, Abandon, and Resist. Read the rest of the article at Spellbinders to find out why so many minor characters die at the midpoint or the climax of the story. There is also a ghostly writing activity for the month of October. Join me today over at Brenda Drake's Blog to learn about the dark history of Raven Valley High School. Then stop over at Ghost Tour Central to find out what you missed and what's coming next on the tour. 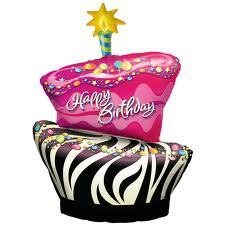 There is a rafflecopter contest at the bottom of the page and lots of free giveaways. It's International Balloon Fiesta time in Albuquerque. The sky explodes with color. Motorists stop at random places along the road to watch hot air balloons descend, chase crews can be seen racing all over town, the population expands by 90,000 tourists and over 500 hot air balloons, and a general aura of magic takes over the city. Locals like me usually avoid Balloon Fiesta Park, the take-off field built especially for this once a year event, unless we have out of town visitors we want to impress. Everyone has to try it at least once. It's hard to describe the experience of watching hundreds of balloons inflating all around you as they slowly lift toward the sky. The traffic is a nightmare and you must get out there at 5:00 a.m. to find a decent parking place, but there's nothing like it. There's plenty of action going on around town too, though. Locals and tourists alike gather at viewing hot spots. Depending on the direction of the wind, you might wake up to find balloons flying right over your house, and if they get low enough, you can hear the swoosh of the butane coming up from the basket as it inflates the balloon. You never know where a balloon might land. This one came down in a vacant lot in the Trader Joe's near our house and further down the street another one landed at the middle School. A few years ago a balloon landed on the field right in the middle of my daughter's marching band practice. Sometimes they end up in parking lots, or even in the middle of the river, which is less hazardous than it sounds thanks to the drought. The photo below shows balloons landing on the Sandia Indian Reservation just north of town, and just a little further beyond that, the parking lot of the Sandia Casino is filled with people watching the event from the comfort of RVs, pickup trucks, and car hoods. Balloons are finicky. They require certain weather conditions to be able to take off. Yesterday thousands of tourists left the field in disappointment because the wind prevented the balloons from going up at all. It wasn't a total disappointment. There is a fair-like atmosphere at Balloon Fiesta Park and the chance that the event you came thousands of miles to view may not happen at all, actually adds to the excitement when all goes well. Cheers go up from the crowd as balloons take off and there is a camaraderie of those who are brave enough to face the traffic and the chilly autumn morning. The balloons remind me that things like rivers and air currents and life's events all flow in uncertain and fascinating ways. They make us all stop, sometimes in the middle of traffic, to watch in wonder and discover how enchanting it can be to embrace the unpredictable. Today visit Stop #2 of the FORGET ME NOT Ghost Tour. as they go hunting for ghosts. Watch their video Here! STOP #1 of the Forget Me Not GHOST TOUR goes live today at Kimberley's Wanderings. "The Nine Circles of Raven Valley High." of the school and why. to find out what's coming next. in a tweet or post or text. My paranormal verse novel goes on sale today at bookstores everywhere and amazon.com. 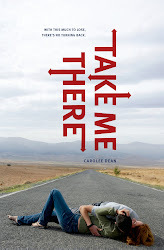 It's available in hardcover and as an e-reader. Read the wonderful Kirkus review. Here's another review from Alamosa Books. And come back tomorrow, October 3 for the start of the Ghost Tour. That's when I decided to interview Elizabeth Anker, the owner of Alamosa Books, our local independent children's books store. I figured teachers and librarians would also be interested in exploring these different categories and hearing what a book seller thinks of their appeal to young readers. A large part of being able to recommend a book to a young person is knowing what these different genres contain. Below are Elizabeth's thoughts on the subject. She says Steampunk started with good writers, mainly in Britain, writing on the edge of science fiction. Then editors saw the trend and began looking for other books with similar themes. These stories tend to be more about a similar look and an idea rather than a similar story line. The look is basically Victorian with Victorian type costumes, gadgets, inventions, and creative weaponry. 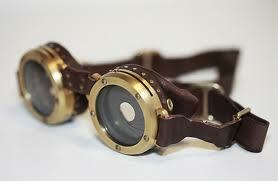 Goggles of some kind are almost always involved. Plots involve adventurers out to seek their fortunes or defeat bad guys in creative and technological ways. Although drawing on elements of Victorian England, these stories are not so much set in the past as they are set in parallel worlds with Victorianesque influences. Elizabeth says Sherlock Holmes stories, which actually take place in Victorian times, are a strong influence. Holmes's nemesis Moriarty is the perfect model for the archetypical steampunk bad guy is often based upon reliance on high tech (for the times) weaponry used by a villain who is trying to take over the world. Moriarty is not influenced by morality at all and many steam punk villains are equally as capitalistic. Steam is often the primary energy source of the times, but something magical is usually involved as well. There is a lot of true science and pseudo science woven through these stories. In the better cases it's real science with pseudo science on the edge, but based in a true science like physics. In books trying for the trend but not so concerned with research it's purely magical in many cases.